Picture is from last month when UNISON members went out to support Mary Locke, who is standing to be a Labour Councillor in Bournville, Birmingham. 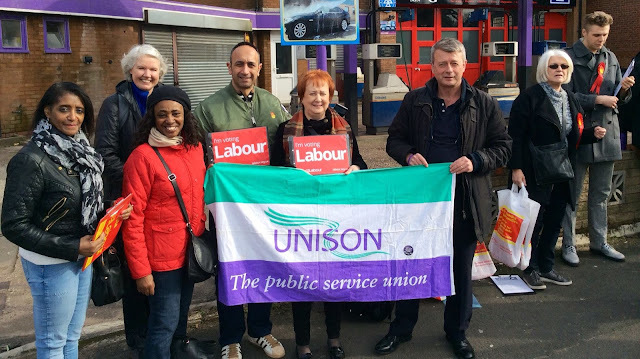 Mary is a UNISON NEC member and NHS worker. She faces a tough fight on May 5. At the moment there are 2 Tories and one Labour Councillor representing the ward. The current Labour Councillor is stepping down due to ill health and she is standing to replace him. Only one seat is up for re-election this year. The next Super Saturday is on 23 April 2016 meeting outside Bournville Railway Station at 2pm ( this is about 10 minutes train journey from Birmingham New Street.